Secretary of State John Kerry declares he is "driving towards the finish" to secure a deal with Iran. Amid reports that the Obama administration may be covertly allowing Iran's nuclear program to enrich more uranium than in initial agreements, Secretary of State John Kerry declared on Wednesday he was "driving towards the finish" to secure a deal with Iran. Speaking to reporters in Paris, Kerry was quoted by AFP as having said there was "no intention at this point of talking about an extension" as ministers stepped up shuttle diplomacy ahead of the deadline. 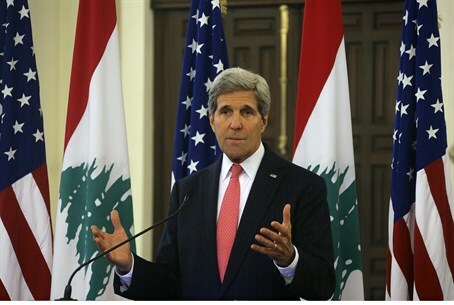 "We are not contemplating an extension," stressed Kerry, ahead of what are likely to be crunch talks with Iranian Foreign Minister Mohammad Javad Zarif and outgoing EU foreign policy chief Catherine Ashton in Muscat on November 9-10. "We are driving towards the finish with the view we are to trying to get it done," he said, according to AFP. The meeting in Oman comes amid recognition that serious gaps still remain between global powers grouped under the so-called P5+1 powers -- Britain, China, France, Russia and the United States plus Germany -- and Iran. Kerry has previously warned that the coming weeks will finally reveal whether the Islamic Republic is truly prepared to make the tough decisions needed to curb its suspect nuclear program and win a lifting of international sanctions. Months of intense negotiations, including between Kerry and Zarif in mid-October in Vienna, have made some progress but appear deadlocked on the key issues of uranium enrichment and the pace of any sanctions relief. Iran, meanwhile, has been toughening its stance in recent weeks. Senior Iranian negotiator Abbas Araqchi said last week he sees no prospect for a deal unless the other side abandons its “illogical excessive demands”. The size of Iran’s centrifuge inventory is a key sticking point in deal talks, with experts saying that the total centrifuge count is close to 10,000. Iran, for its part, has drawn a "red line" at maintaining enough centrifuges to produce enough uranium for 38 A-bombs per year.